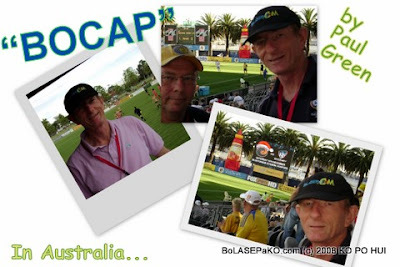 Many Thanks to Mr Paul Green (back in Australia "for the time being" hehehe...), who has been a wonderful and loyal supporter of "BoLASEPaKO"
I have not decided what to do with my "BOCAP", on how to market and peddle them. After all, its small quantity meant that the cost of making them were slightly higher and selling them cheaply is impossible (nobody likes to venture into a loss-making business eh?). However, I don't expect this cap to be a fast-seller too, any marketing genius out there to share your thoughts? At the meantime, I managed to convince Mr Paul Green in Australia to endorse "BOCAP"